The daily deal on Audible isn’t something you choose or pay for. It’s completely up to the Audible folks. In fact, I didn’t even know Circle of Reign had been chosen until a fan alerted me. I was off in my hopes. Way off. The single day sales for Circle of Reign were in fact well into the 5 figures. Now, for Rothfuss, Sanderson, Ryan, Butcher, Martin and the other masters, this is surely no big deal. After picking myself up off the floor (I think my wife had to slap me a few times to get me to start breathing again), I decided to check the epic fantasy rankings on Audible. A Game of Thrones had been number 1 for as long as I can remember. Circle of Reign had been in the top 40 before, which was something in and of itself in my mind. Seeing my self-published, debut book next to so many books by authors I truly love was enough. This morning, however, I couldn’t find my book. I skipped back 3-4 pages because I was sure it wasn’t higher ranked than that. After not finding it there, I went back another 5 pages before the idea struck me that maybe I should take a look at page 2. It had been there once, when it was part of the top 40. Almost giving up, I decide to go see if A Game of Thrones was still sitting happy at number 1 or if it had lost it to The Hobbit, or to Firefight, Brandon Sanderson’s follow up to Steelheart, which I cannot wait to get to. Instead, I saw Circle of Reign, sitting at the number 1 spot, just ahead of Martin’s masterpiece. There was still some sleep in my eyes, and I was certain I had misread things. But, no, it was true. 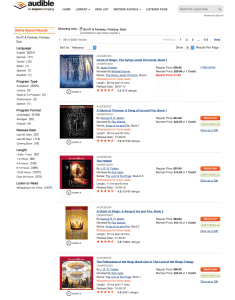 In the broader genre of sci-fi/fantasy, my book was sitting at number 2 overall, just behind The Martian. I couldn’t help feeling denial and disbelief, and a desire to listen to The Martian yet again. Across all categories, it clocked in at number 13. Will it last? No. As a new, self-published author, I don’t have the prominence that these other tried and tested authors do. Circle of Reign will slide in its rankings as the days go on, although its regular sales have been relatively strong along with the reviews, a fact I am grateful for. It’s not a perfect book, but neither am I. I’m learning every day about my craft. Regardless, for a college drop out, debut author, I’ll enjoy the throne for a day. Maybe, just maybe, for two. I thank all my fans that have been so supportive and enthusiastic for The Dying Lands Chronicle. While all authors write more for themselves, it’s wonderful to get a “thatta boy” every once in a while. Cheers to Audible and ACX as well for helping the little guy out. NEXR DAY EDIT: Circle of Reign is number 1 on Amazon for audiobooks in epic fantasy and edged out THE MARTIAN for the number 1 spot in all scifi/fantasy on Audible.com. The humbled disbelief continues. I’m sure tomorrow reality will sink in. Circle of Reign, Book 1 of The Dying Lands Chronicle, is available on in print, digital, and audio format. Altar of Influence: The Orsarian War, is a prelude to The Dying Lands Chronicle. Also available in print, digital and audio.